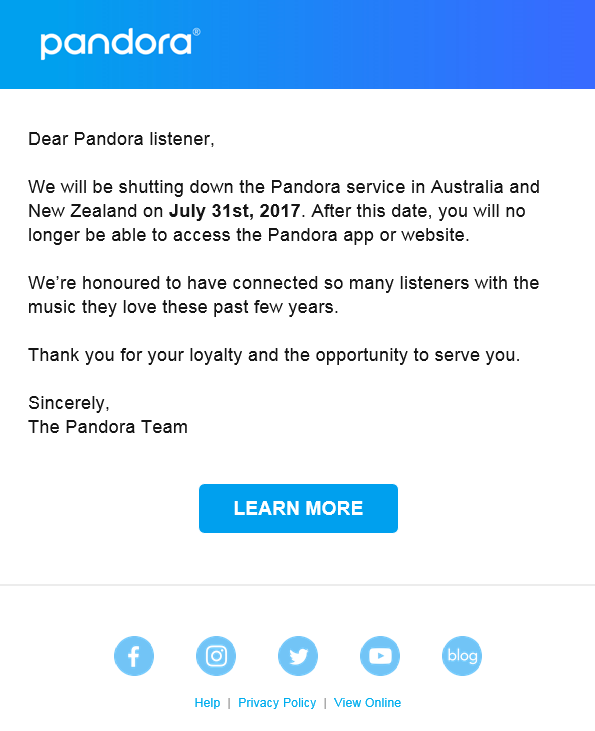 Pandora listeners will be shedding a few tears today after the music streaming service revealed to them via email that it will be shutting down its operations in Australia and New Zealand at the end of the month. The email said that Pandora was “honoured to have connected so many listeners with the music they love over the past few years”. “Thank you for your loyalty and the opportunity to serve you,” it said. An official statement by Pandora said: “After analysis and consideration of external factors, we have decided to discontinue our operations in Australia and New Zealand and will shut down the service on July 31, 2017. Pandora’s director of business development and partnerships, Rick Gleave, added: “I am honoured to have worked with the talented and dedicated team leading our Australia and New Zealand operations. “Since we opened our doors in 2012, the team grew our user base to over one million monthly listeners, delivered market-shaping advertising and retail distribution deals and executed highly successful music events and sponsorships.